Immunogen: Synthetic peptide corresponding to a portion of human Hsc70 (Hsp73). The sequence is completely conserved in rat, mouse, hamster and bovine. 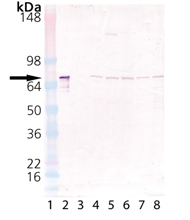 Application Notes: Detects a band of ~73kDa by Western blot. Immunohistochemistry analysis of human spleen tissue stained with HSC70/HSP73, pAb at 10µg/ml.